It was the first long weekend of Independence day of 2011 after Pamela had joined her job. We were very keen to get away from Bangalore as last time it was March when we went to Chickbelapur. Initial plan was to visit Hampi; but after talking to few homestay around we decided against it as that part of Karnataka was expecting to get unusual amount of rain and flood could be any time. 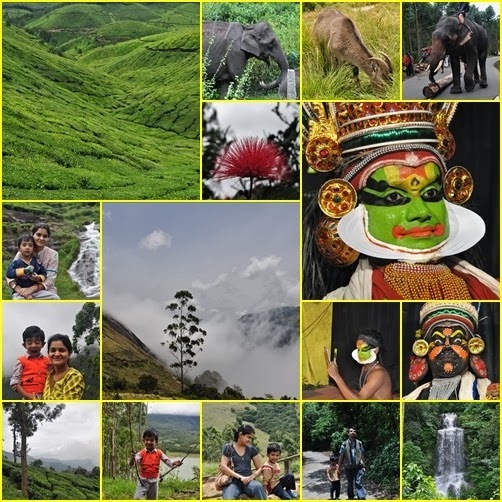 While we were thinking where to go and on browsing Mahindra Homestay found there is 50% discount offer (with complementary breakfast) in one homestay in Munnar. We just booked it without any second thought. We started on Thursday evening around 5 PM from Bangalore and reached Salem at 21:30 PM with one stop at old faithful A2B in Krishnagiri. It was raining almost from 7.00pm and had to drive carefully. We had no clue on where to stay at Salem and on asking at Salem Toll Plaza we were directed for GRT Grand. It is on leftside on highway; we asked for little bit of discount on their printed price which they agreed. GRT is a premier hotel chain within Tamil Nadu with modern room and fully furnished. On Friday after a good night sleep and grand breakfast we started around 10:30. Just before leaving hotel suddenly met with one of my college junior who was going to Thekkady(Periyar Wildlife Sanctuary). Well, after short talk we continued on NH-47, and reached Chinnar Forest via Tiruppur (famous for hosiery products) and Udumalaipettai. There were around 4 check points where you need to get out of the car and write your name with Forest officials. Did not carried any money with me on purpose and did not paid a single penny of bribe, this officials expect anyone with a KA number plate car as IT professional with spare cash for them. After many photo stops on the way we reached Munnar around 6 PM. Our Home Stay was next to Tall Tree resort. It was raining cats and dogs by then. Saturday -> It rained whole night quite heavily and in the morning we were under impression that there is no room for going out. But somehow rain slowed around 10ish and our host suggested we move out as next day might be more worse. So we went for Mattupetty direction ( Mattupetty Dam, Echo point, Shooting point, Kundale Lake and Top station ). We reached back to Munnar town for snack but could not find any good one. Around 5PM we reached back homestay. Sunday –> It was not raining and we headed for Eravikulam National Park. Our host suggested that we should be there by 8 but we were bit late and there was long queue. As the day was sunny many people were there, after an hour long wait we started in the Park bus and reached Rajamala. We hiked on the paved pathway; was very lucky to spot some Nilgiri Tahr. And slowly it became cloudy after which we went to Tea Factory Museum next to Munnar town. Post lunch we headed to Pallivasal for a Kathakali show. The Kathakali show was spectacular . Monday 15th August -> Started around 7 from HomeStay, reached Salem (GRT Grand) around 1:30 PM for lunch. We spend more money on a grand fat lunch buffet compared to last three dinners. Reached Bangalore back at 5:30PM. The road was great no complain.